If you are not quite sure what a game system is, let me give you a quick definition with an example. A game system is a set of components with which you can play multiple different games. A standard deck of 52 playing cards is a great example. You can play many different games with a standard deck of cards, including Poker, Rummy, Go Fish and Crazy Eights. 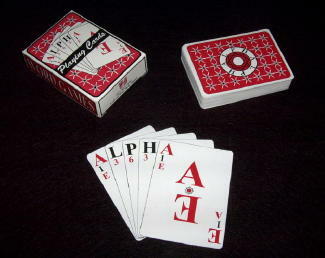 The Alpha Word Game System is a game system that is based on the original Alpha Playing Cards which was created in 1997. It consists of a deck of Alpha Playing Cards, a set of Alpha Tiles and a double set of Alpha Dice. The three components (the cards, tiles and dice) of the game system are by them-self a game system that can be used separately to play a variety games or combined to play more game. You can say it's a game system made up of game systems. If you would like to know more about the Alpha Word Game System you should go to to the community wiki for the Alpha Word Game System at alphagames.org. There you will find the rules for all the current games, more information about the game system and downloadable artwork so you can make your own set of cards, tiles and dice. There is also info on where to buy the Alpha Word Game System; if you prefer someone else to make one for you. And if you are the creative type and decide to make a game or two that uses the Alpha Word Game System you can add the game there so others may enjoy it. Can be used to play several different games. 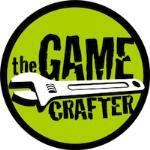 You can create your own games. The original Alpha Playing Cards were first conceived in 1994 and self-published in 1997 by tjgames (me). The new Alpha Playing Cards have the marked vowels, the original Alpha Playing Cards only had the semi-wild vowels; the idea for the marked vowels didn't come till several years after the first publication and wasn't added to the deck until the 2011 release of the Alpha Word Game System.. There will not be a reprint of the original Alpha Playing Cards, but there are still a few left. If you are interested in buying a deck you can purchase them via PayPal. Creative Child Magazine 2006 Game of the Year Award.